It's been a little while since I've broken the 2012 version of Goodwin Champions. As many of you know, this is a product that intrigues me greatly. I enjoy the look of the cards and love the variety it offers. Hits are very hard to come by in this product... which is a bummer. Paying full price for one of these is out of the question, but the current price of under $7 is OK with me! This is the year that Goodwin had black borders. Back in the day black bordered cards meant that they would be difficult to keep in good condition. Often times black bordered cards in mint condition garnered quite a premium. Well, I'm pretty sure these base cards will never be worth too much, but I do like how they look. 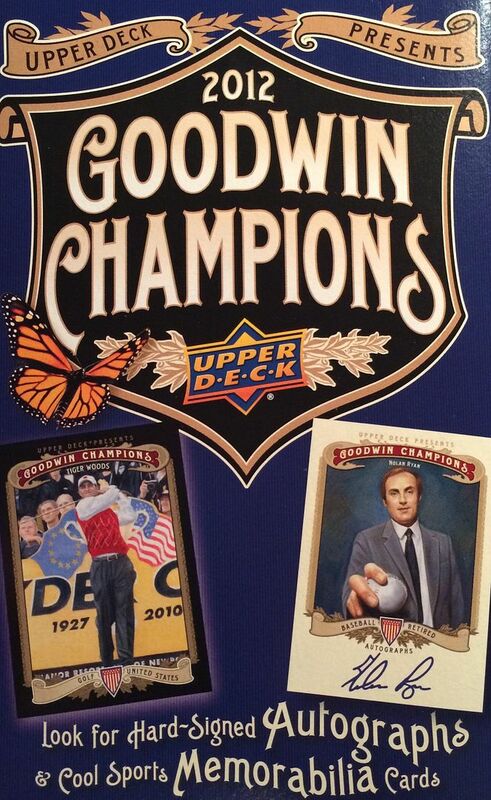 Goodwin Champions cards are printed on old school cardboard with that old cardboard look on the back. That might be some of the appeal of this set to me. It really brings back the memories of collecting these types of cards when I was a kid. Well... if anything, this blaster had some pretty spectacular superstar base cards. It's just too bad I already have those from previous Goodwin breaks. I guess if this was 20 years ago, this would have been a stellar box as base cards were actually worth something back then. Today though, the base cards are forgettable and nothing of note really came out of this blaster box. I did get a mini of Adrian Peterson... which would have been good a year ago... but his legal troubles have really put a damper on his reputation. There just wasn't much to write home about with this one. 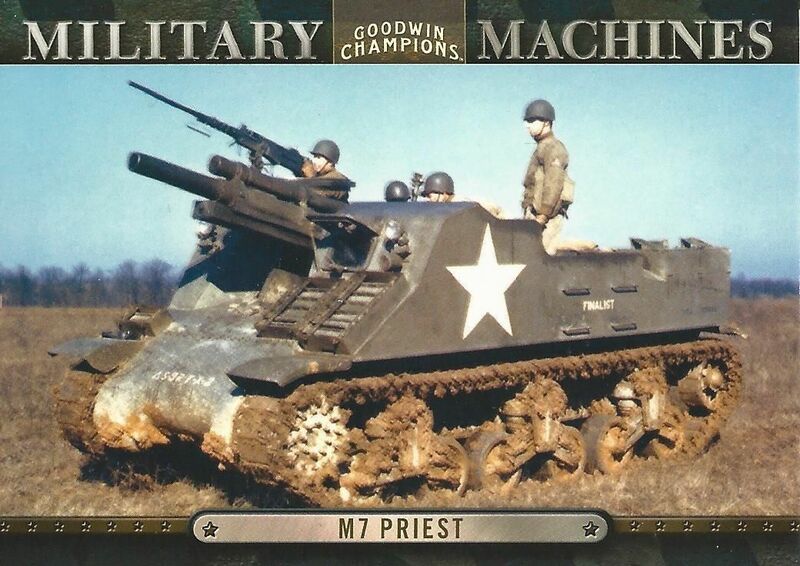 Something looked a bit different with this Military Machines card that I couldn't figure out for a while. It's in color! It's sort of that old school technicolor look. Kind of neat, I guess. This Lady Luck mini card depicts a pretty significant moment in college basketball history. I remember what a huge deal this was back in the day. 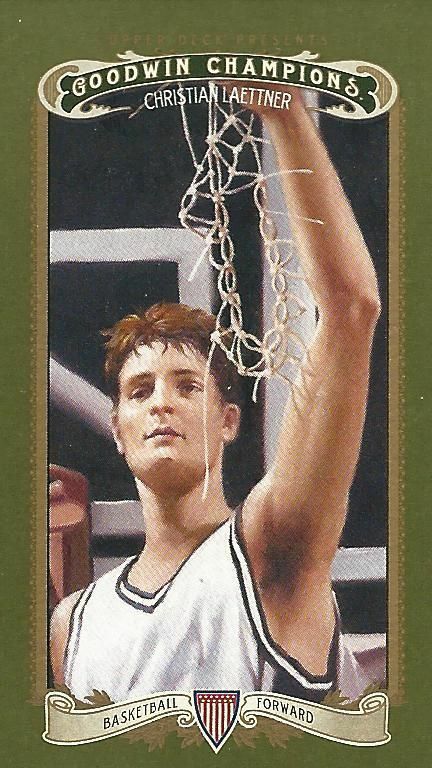 Laettner never panned out, but his college legacy is undeniable. I had to go with a hockey card for this top spot. 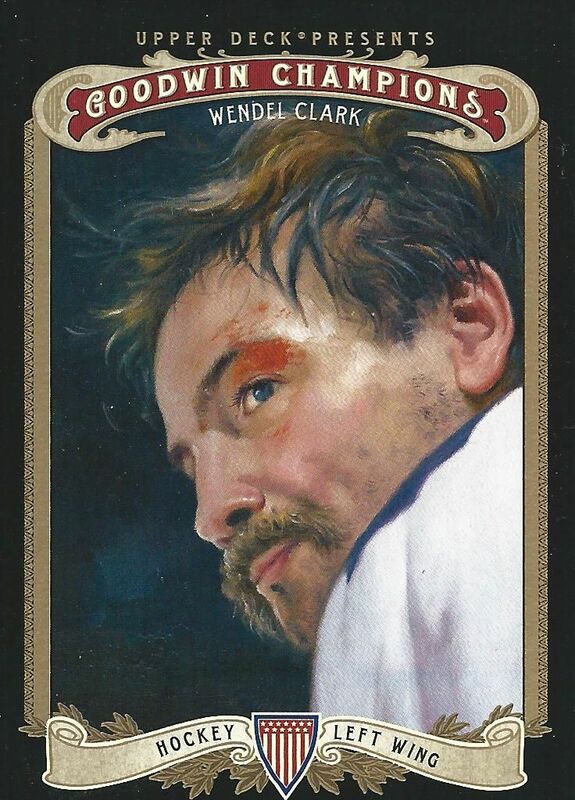 I could have chosen Sid the Kid or The Great One, but I like how this card shows Clark with his battle scars. That was the kind of player he was and this card does him justice. There wasn't really anything in this blaster that I really liked too much. Finding my top three was even a stretch! I didn't pay as much for this box as I did for the last one I opened, but I still feel like I didn't get my money's worth. That's really too bad! Will I keep trying these blasters? Probably. I'm a sucker for this stuff!